William Taft was the 27th President of the United States who served in office from March 4, 1909 to March 4, 1913. What was the life of William Taft like? The short biography of President William Taft covers important information and facts about his early life, his family, career and the famous events and achievements of his political life. Our short biography of William Taft provides an interesting and easy way to learn about the life of the President. The following important facts provide a fast overview of important facts about President William Taft. Facts and Info: William Taft was the 27th president of America and is the only President who became a Supreme Court Justice. 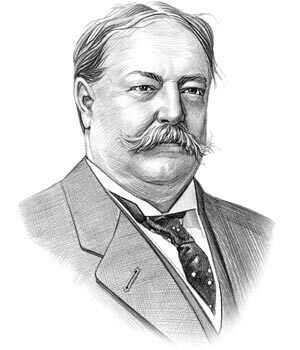 His presidency was characterized by Taft's Dollar Diplomacy and the dissolution of trusts. For additional info refer to 20 Facts about William Taft. Facts and Info: He was born on September 15, 1857 in Cincinnati, Ohio. His father, Alphonso Taft, was a distinguished Republican who served under President Ulysses Grant. His ambitious father and wife had high expectations of Taft. William met all of his father’s expectations and became president. He died on March 8, 1930 in Washington D.C.
Facts and Info: The career of William Taft included the roles of Lawyer, Politician and Statesman. He received an excellent education at Yale College and Cincinnati Law School He became the 27th President of America in 1909 and served for 4 years until 1913. Facts and Info: William Taft married Helen Herron on June 19, 1886. Helen Herron, who Taft nicknamed "Nellie," was an intelligent woman whose ambitions for her husband would be instrumental in the evolution of his career. They had 3 children whose names were Robert Alphonso, Helen Herron and Charles Phelps. Facts and Info: William Taft belonged to the Republican Political Party. He was 51 years old when he was inaugurated as the 27th president. Inauguration is a President's swearing-in ceremony. James Sherman stood as the Vice President. Taft's Dollar Diplomacy called for diplomatic and military action to further business interests overseas. For additional facts refer to his Presidential Cabinet members. Short Biography of William Taft: What he was like! Facts and Info: William Taft was 6 feet 2 inches in height and his weight fluctuated reaching a hefty 300 pounds. His weight earned him the nickname of “Big Bill”. He had chestnut brown hair, blue eyes and wore a great handlebar moustache. He was the first president to own a car and had his stables converted into a four-car garage. William Taft famously kept a cow on the White House lawn to supply him with fresh milk. Facts and Info: During his lifetime he played a key role in important events of the era. Some of the important events which occurred during his presidency were the Payne-Aldrich Tariff Act which lowered certain tariffs on goods entering the United States. Taft's Dollar Diplomacy used the military might of the United States to promote American business interests abroad. His Antitrust Policy involved the dissolution of trusts. Facts and Info: During his life William Taft suffered from a skull fracture and head injury due to a wagon accident. He had other various health problems including typhoid fever, dysentery, gout, lumbago and rheumatoid arthritis. Facts and Info: William Taft died of a heart attack on March 8, 1930 in Washington D.C. He was buried at Arlington National Cemetery in Virginia. Taft is one of two presidents who are buried in the cemetery. His funeral was the first to be broadcast on the radio. The short biography of William Taft provides a fast overview of the key facts and events about his life and the accomplishments of his presidential term in office. The following William Taft video enables you to sit back and listen to the history of his personal and political life - a useful educational resource for kids, children and schools learning about the life of President William Taft.